Maine lobster boat races. Photo courtesy of Billy Kitchen. The 2014 Maine Lobster Boat Races Schedule is below along with additional information on some of the villages which host the races. June 14th: Boothbay, Maine – Boothbay is one of the key races in the circuit and the town and harbor are beautiful to visit. If you live in Southern Maine or are traveling from out of state, this is an excellent lobster boat race to visit. This is a points race. June 15th: Rockland, Maine – This is a points race. June 29th: Bass Harbor, Maine – This is a points race. July 5th: Moosabec Reach, Maine – The Jonesport Beals lobster boat race is perhaps the most iconic race of the season. This is because lobster boat racing as we know it today originated in Jonesport and Beals. Between these two fishing villages lies a sheltered body of water called Moosabec Reach which served as an ideal testing ground for boat builders to trial their boat designs when moter-power replaced sails in the 1900s. The Moosabec Races have always been highly competitive, with lobster fishermen battling it out for trophies, prizes and, most importantly, bragging rights. The towns of Jonesport and Beals come to life around the races, with parades, beauty pageants and crafts fairs. The dramatic, arching bridge connecting the two towns is a perfect place to take in the racing action. This is a points race. 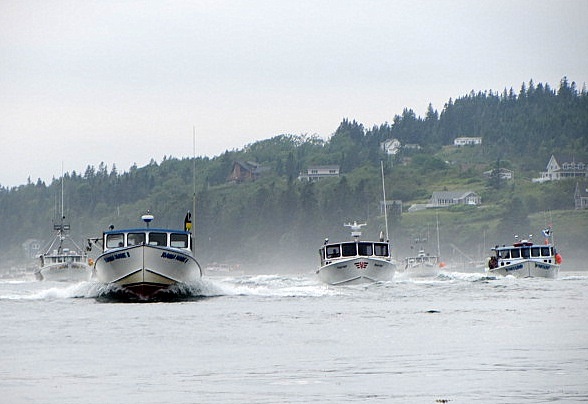 July 13th: Stonington, Maine – The Stonington Lobster Boat Races are great to go to if you’re interested in seeing an authentic, picturesque lobster fishing village which also has some nice amenities. This small town, perched on an archipelago, brings in more lobster landings than anywhere else in the state. Its quaint main street, which runs along the harbor, feels like it’s straight out of a Norman Rockwell painting and there are several simple restaurants and gift shops and some nice places to stay right on the waterfront. If you want more information on the town of Stonington, with recommendations on places to eat and stay, click here. This is a points race. July 27th: Harpswell, Maine – This is a points race. August 9th: Winter Harbor, Maine – Smaller than Stonington, Winter Harbor is a classic Downeast fishing village with a simple Main Street (home to a classic 5 and 10 and a popular bakery) and a snug little harbor filled with lobster boats. This harbor, and the town itself, really comes to life during the Winter Harbor Lobster Festival, which includes the boat races, a craft fair and a lobster dinner. For more information on the town of Winter Harbor and the Lobster Festival, with recommendations on places to eat and stay, click here. This is a points race. August 10th: Pemaquid, Maine – This is a non-points race. August 16th: Long Island – This is a non-points race. August 17th: Portland, Maine – This is a points race. The Searsport and Friendship races have been canceled this year. There is also no mention of the Eastport race in this year’s schedule though the Eastport race typically occurs during their annual Pirate Festival, which is schedule for the 5th, 6th and 7th of September 2014. For more information on Eastport, click here. There are also informal lobster boat races throughout the state. Cutler hosts one such race as part of its 4th of July festivities. More information on the these festivities and the town of Cutler can be found if you click here. 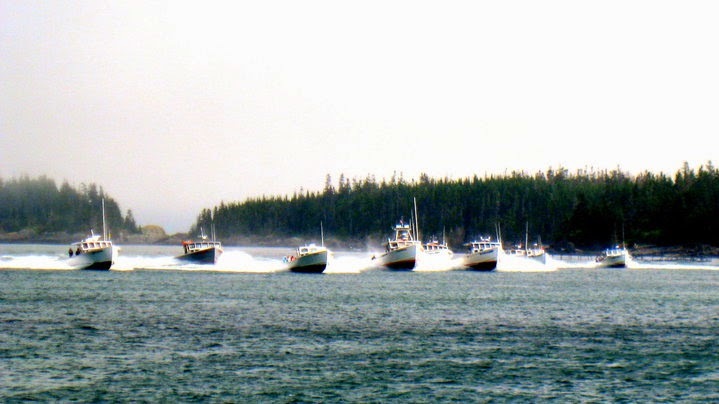 The Cutler Lobster Boat Races. Photo courtesy of Billy Kitchen. Cutler Maine Lobster Boat Races. Photo Courtesy of Billy Kitchen. Can I please get information on the Portland, ME Lobster Boat races. I would like to take my niece & nephew but need to know where & when and the best vantage points. Let me try to get some more insight for you on that. The races typically start at 10am. Will check on best spot for viewing. Hello Roberta, my sources tell me that this race is best viewed from Fort Allen Park/the Eastern Promenade (including the walk-way below). There will be a speaker system there giving race commentary which is nice. Hope you enjoy the races!